If you dropped $600 on an Oculus Rift, you’ll get a copy of Lucky’s Tale along with the headset. 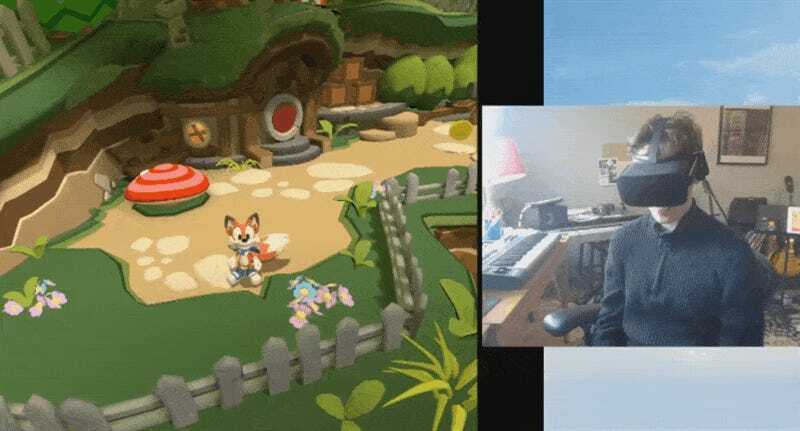 It’s basically Oculus’s shot at making their own Super Mario 64, and while it doesn’t quite hit those rarified heights, it is pretty cute. What it is: The game gives you control of Lucky, an adorable little fox in search of his adorable little pig buddy on an adorable adventure through an adorable storybook world. It’s polished and definitely channels N64 games, though in the first four levels or so I haven’t encountered much that would get me excited beyond how great it looks in VR. Those good looks ain’t nothing, though: In particular, the miniaturized, side-scrolling underground levels look real enough to touch. Lucky’s Tale is a solid launch game that easily makes the case for how non-first-person games can still be cool in VR. Throughout the week, I’ll be posting a series of short videos like this one to give an idea of how these VR games work. For more thoughts on the Oculus Rift itself, check out my full write-up.